In my last article I discussed how to cope with stress that is brought about by loss. This month we look at the other significant cause of stress, which is role change. This could be taking up a new job, graduating from school or getting married. Even a happy role change is a cause for stress. We humans and all organisms like to live in a state of equilibrium. The maintaining of the equilibrium or balance of the internal environment of the body is called homeostasis. All our bodily mechanisms are geared towards maintaining this homeostasis. If the homeostasis cannot be maintained the body sickens and dies. This central tenet of biology was propounded by the great physiologist Claude Bernard who went so far as to state ‘The fixity of the internal environment is the condition for free and independent existence’. As much as the constancy of the internal environment is a necessary condition for healthy existence, and for a human being to live happily, there should be some constancy in the external environment as well. Unlike the internal environment we have less control over our external world, and again unlike the internal environment living in unchanging surroundings or circumstances is inimical to healthy living. This may sound paradoxical at first. On the one hand to face change is to undergo stress but to live out your life in a dull routine day after day too is unhealthy. The reality is that the greatest stress is caused by changes that are unexpected, changes that are extensive, and changes that we not equipped to deal with. This gives us a clue as to how to deal with change. True some changes are wholly unexpected but if you think carefully most of these so-called unexpected changes could have been anticipated if not prevented. 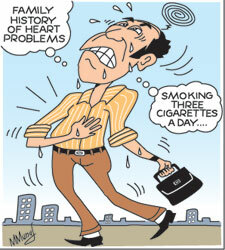 An example is that of a person who gets a myocardial infarction or ‘heart attack’. It is a life changing, devastating experience for most people. In a minority of persons it is truly unexpected but in most people it could have been anticipated or even prevented. The family history of heart problems, smoking those cigarettes (‘It was just a few a day doctor’), the sedentary lifestyle, the blood sugar that was never controlled were all danger signs that were ignored. Therefore an important way of dealing with stress, brought about by role change, is anticipation. We humans are far more able to deal with changes that are anticipated than ones that are sprung upon us. How do we anticipate change? After all we cannot see into the future or do we look at our horoscopes or ask the astrologer? If we take time to reflect and plan, a majority of life changes can be anticipated and planned for. We all know that we have to start schooling at a certain age, study for a vocation, leave school and do a job, get married and start a family at different ages and then if we live long enough, face the inevitable process of aging, retirement and finally death. All these things can be planned for in advance and the unexpected turned into an expected event. An extensive and major change in life roles is also a cause for stress. Sometimes this cannot be avoided. But often with foresight and planning role changes can be done in a stepwise manner avoiding sharp shifts in lifestyles. For example if you need to change your career path this could be done in stages allowing time to stabilise before moving on to the next stage. Role changes that we are not equipped to deal with cause severe stress. One of the most stressful jobs in the world is that of being a member of a bomb disposable squad in a battle zone. Are people who take on this job a kind of superior human being who is immune to stress? A study done among members of the British Bomb Disposal Unit operating in Northern Ireland showed that this was not so. They were not superior beings but ordinary men. The difference was that they had received extensive training for their profession which enabled them to face their high risk job with equanimity. So if you are well trained or we take the trouble to train ourselves well for the anticipated role changes of life, the level of stress experienced could be minimised.